Considering everything from writing hit songs for some of the biggest names in the industry to producing their own global smashes, it’s no wonder that Australian twin-sisters NERVO are among dance music’s topflight duos. And today, their success story enters another chapter. For the first single on their brand-new Got Me Baby! Records imprint, the Australian duo – Miriam and Olivia – teamed with Belgian team Wolfpack, resulting in ‘Like Air’. Easing in listeners like a cool breeze on a hot summer day, ‘Like Air’ could very well blow a wind of change through the dance music industry. 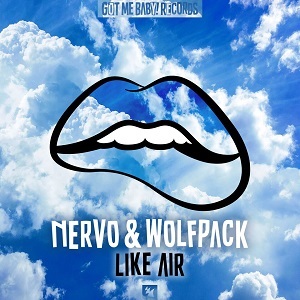 Tiptoeing through a brilliant build-up filled with Miriam and Olivia’s own velvet vocals and impeccable rhythms, this link-up between NERVO and Wolfpack will remain a dancefloor essential for years to come.